Another record month in the Chinese EV Market, this time above 16.000 units, a world best, with the EV Share rising above 0.7%, an incredible result if you consider that last year ended at 0.25% and in 2013 it was just 0.09%! Not only the numbers are growing exponentially (Up 170% YoY), but the ranking itself is changing rapidly, just two months ago the BYD Qin seemed unstoppable, selling 4.030 units, three times more than the Second Placed BAIC E-Series. Third that month was the SAIC Roewe 550 PHEV, followed by the JAC i EV and the Kandi EV microcar. In September, the Best Seller was no longer the Qin, relegated to a discrete Third with only 2.115 units, but the #1 was the Kandi Panda EV, with a personal record of 3.301 units, thus ending a 13 month consecutive streak of #1's for the Qin! And the rest of the Top 5 has more surprises: The Tang SUV replaced the Qin as the best selling BYD (The higher profit margin of the SUV might have something to do with this...), by selling 3.044 units (Record month) earning it a close Second (#1 in October?). And if all this wasn't enough, BYD still managed to launch yet another Plug-in model (The seventh!) to the market: The e5 pure electric debuted with its first 125 registrations, a strong start that might indicate another hot seller for BYD. - Year best also for the BAIC E-Series, with 2.100 units. 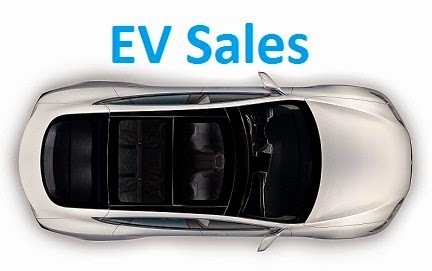 Considering the current performance and that December is usually the EV's best selling month in China, i would say that month will pass the 20k units without a sweat. Looking at the YTD ranking, the top two remain the same, but we have a new Third, with the Kandi Panda EV jumping six(!) positions, while the Tang SUV surged to #8, a five positions jump that will probably be repeated next month. On the losers side we have the Zotye Zhidou E20 down two positions to #7, something is happening to this model, in June it was Third, but since then sales have been in free fall, but it wasn't the only model to drop on the ranking, both Cheries(? ), the QQ EV and the eQ, were down to #10 and #12. Are Chinese plug-in consumers dropping microcars/City cars for larger ones? Looking at the manufacturers ranking, BYD is as always, comfortably ahead in #1, this time with 37% share, followed by Zotye and Kandi, both with 13%, and BAIC (10%) in Fourth. So in short, China's EV Market is booming and unlike past months, where it was dependent of a single model, right now there are several cars pulling the market up, in a sustained way, confirming what many analysts have been saying for years: The EV Revolution will happen first in China. In absolute numbers no market will be able to keep up with China. But it will be interesting to see how China will match up percentage-wise compared to the other market pushing the EV rEVolution, (western) Europe. BYD Song will be available only in the beginning of next year. Maybe this is number of orders? The Song comes in both gas and hybrid versions. The hybrid version isn't available yet, please check news articles for confirmation, perhaps from BYD's website. which type of Kandi EV are included in the statistics? Does the count for the KNDI smaller two seater include the vehicles used for the public/privte Mini Car Share programs (microbus) like they do in Hnagzhou, Kumming, Shanghai and recently started in Ruagoa (sp?) ?? This data must be hard to put together. Good question...i do not know, does anyone knows this? Since they should be listed as registered cars to recieve plates i would expect them to be listed in the official numbers. Same as the Smart ED in germany for "Car2Go". I think thats ok. They are used as EVs. Do we know how many of the Tesla sales this year are new orders, and how many are from their stock of ~2000 2WD Model S cars that had had deposits placed on them but were not picked up?